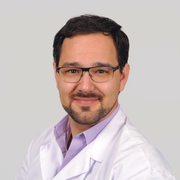 Antonios is an advanced resident in clinical immunology and allergology. He is board certified in Dermatology. His various project include an investigator initiated trial with a new biologic (IL1beta-antagonist canakinumab) that he showed to be highly effective in pyoderma gangrenosum. Also, he described the phenotypic characteristics of pyoderma gangrenosum in Switzerland. He published numerous clinical works, including the Swiss Guideline for Psoriasis Treatment and played an important role in the SDNTT registry. He currently performs basic science research in psoriasis and cytokine expression.